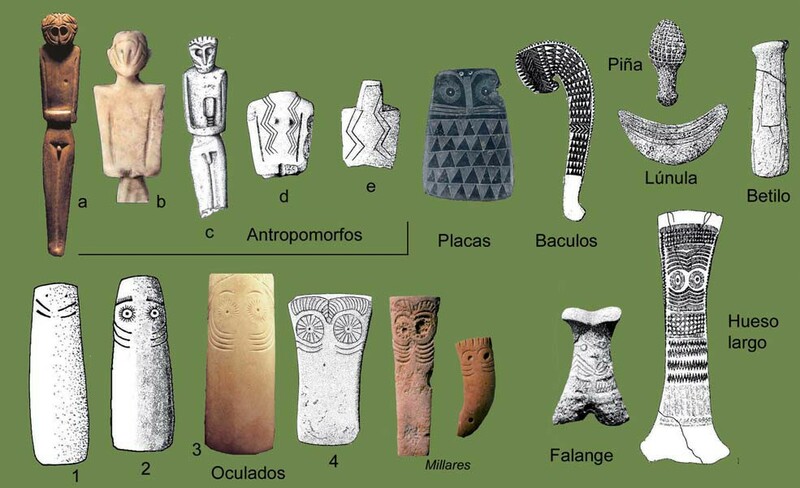 A new study gives us the opportunity to learn about the mysterious SW Iberian plaques from the Chalcolithic period. 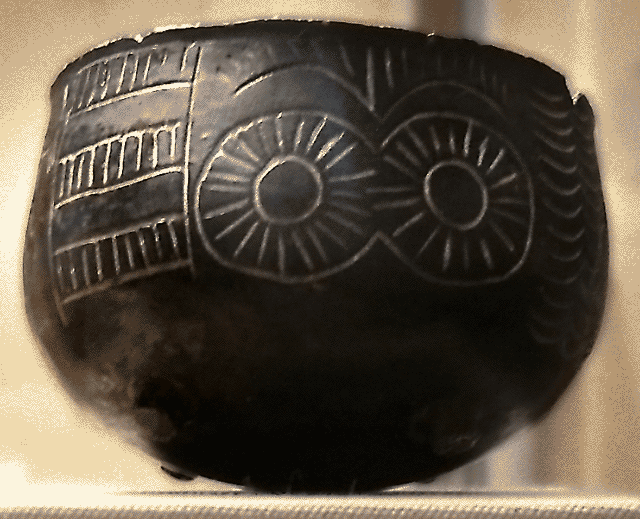 Prehistoric material culture proposed to be symbolic in nature has been the object of considerable archaeological work from diverse theoretical perspectives, yet rarely are methodological tools used to test the interpretations. The lack of testing is often justified by invoking the opinion that the slippery nature of past human symbolism cannot easily be tackled by the scientific method. One such case, from the southwestern Iberian Peninsula, involves engraved stone plaques from megalithic funerary monuments dating ca. 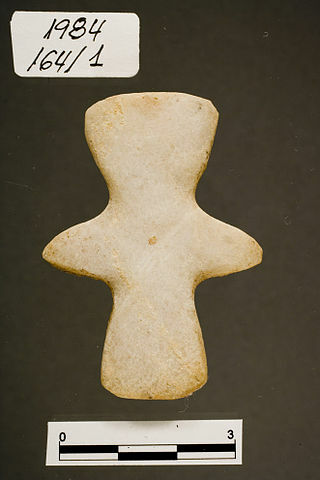 3,500–2,750 B.C. (calibrated age). One widely accepted proposal is that the plaques are ancient mnemonic devices that record genealogies. The analysis reported here demonstrates that this is not the case, even when the most supportive data and techniques are used. Rather, we suspect there was a common ideological background to the use of plaques that overlay the southwestern Iberian Peninsula, with little or no geographic patterning. This would entail a cultural system in which plaque design was based on a fundamental core idea, with a number of mutable and variable elements surrounding it. Figure 1. Engraved plaques from the Iberian Peninsula. 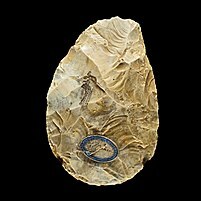 Rather than dwelling in the central discussion of the study, which is to empirically discard the genealogical hypothesis (for which it is surely best to read the paper as such), my main interest is to share this not often seldom discussed Chalcolithic phenomenon which is limited to SW Iberia (i.e. Southern Portugal and nearby areas of Spain). This study gives us the opportunity of not just knowing it but also contemplate its unity and diversity from a large number of specimens. Fig. 2 – General design of the plaques. 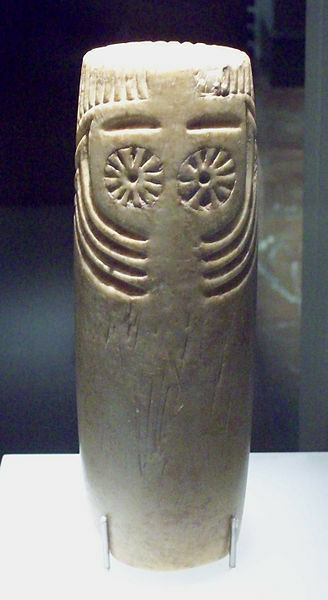 The dates of the “plaque idols”, as they are often known in the literature, range from c. 2650 to c. 2100 BCE[see note below], corresponding to the development of the first Iberian (and West European) civilizations (fortified towns) in the area, which began c. 2600 BCE, with two main centers around modern Lisbon (Zambujal) and Almería (Los Millares) but that also knew of other such towns especially in Southern Portugal. All that in the context of dolmenic Megalithism, with the introduction of new burial designs such as the tholos (beehive tomb) or the artificial cave, innovations that may have been restricted for some elites. Important note (update Feb 25): the dates given in the previous paragraph are uncalibrated (i.e. raw BP minus 1950). The calibrated dates are quite older: between c. 3500 and 2600 “actual years” BCE, as you can check in table 1. They still overlap with the known dates for Los Millares (c. 3200–2300 BCE) and its “Almeriense” precursor culture but less so with Zambujal (c. 2600-1300 BCE, subject to possible revisions). My apologies for the confusion. The most dense area, and seemingly also the most diverse, for this kind of findings is the southern part of Évora district (Central Alentejo, near the Guadiana River, known as River Ana in Antiquity), a mostly flat country with some low hills (the highest peak in the district has 600 m.) and a scattered natural forestry of corks and holm oaks. It was once known as Portugal’s “bread basket” and was surely of relevance in the Neolithic and Chalcolithic period, especially in relation with the development of the influential burial style of dolmens or cairns (known as mamoas in Portuguese), later partly replaced by tholoi. The plaques’ phenomenon is anyhow found through all the Southern half of Portugal, with limited penetration into Spanish Extremadura. Another important region was the Lisbon Peninsula, which was almost certainly a more important civilization and geopolitical center, with notable urban development in this period and becoming a major center of Bell Beaker. Its main city, Zambujal (Torres Vedras) still barely researched was connected to the Atlantic Ocean by a 10-14 km long marine branch that was silted (tsunami?) at the end of its occupation (end of Bronze Age?) Hence we are talking of a major city (for the standards of the time at least) which lasted for more than a thousand years and whose influence encompassed once at the very least much of Southwestern Europe (and, if we accept that it was at the origins of the Bell Beaker, then all Western Europe and parts of North Africa). Figure 3. 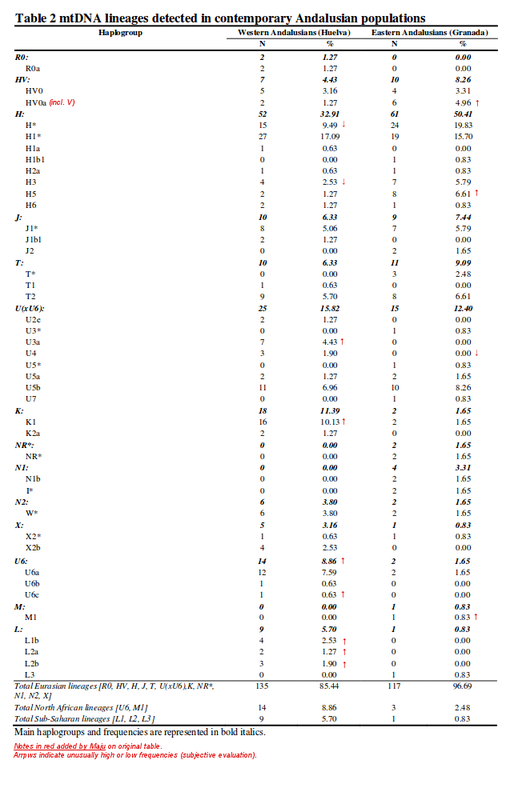 Character states used in the analysis. Back to the plaques, I don’t feel able to say anything about them that is not in the paper (read it and browse the many figures, please), except for one thing: some of the characteristics of certain plaques compare well with other “religious” iconography from the Southern Iberian Peninsula in Chalcolithic times. 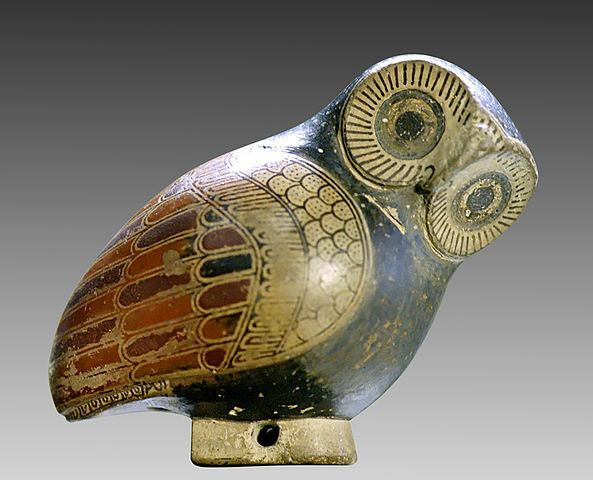 For example plaque A in figure 1 clearly has the “oculado” (eyed) symbol found in many other artistic elements of the time and believed to represent some divinity and very likely representing the eyes of an owl (suspected to have been an ancient divinity or divine symbol in much of Europe, and found also in India). So I would think that all or at least many may well represent the same kind of divinity, possibly related to the origins of several more historical deities such as Athena (Greece) or Mari (Basque Country). (Check for the updates below, please). The late Epipaleolithic forager from NW Iberia (previously discussed here) had the patrilineal haplogroup C6, found so far only very rarely among modern Europeans (Scozzari 2012). This, I must say, I know by the moment only from secondary sources (Eurogenes, Dienekes and a personal communication) because I have not been able yet to put my hands on the relevant paper and this key detail is not mentioned in the abstract. → freely available supplementary materials. Until the discovery of this C6 lineage, there were some strong reasons to suspect that Y-DNA C may have coalesced already in SE Asia or, at least, very close to it, with its subclades forming by pairs a three pointed star with geographical center in that area: C1 and C3 in NE Asia (and America), C2 and C4 in Wallacea and Australasia and C5 and some rather homogeneous C* in India. The discovery of this C6 lineage and its confirmation as a Paleolithic one in Europe (i.e. not a “recent” arrival from somewhere else) add phylogenetic weight to the Western geography of haplogroup C, one of two main subdivisions of the main non-African Y-DNA lineage CF. However we cannot yet reach to conclusions about the “exact” origins of C because the macro-lineage still awaits improvement of its phylogenetic structure at the basal levels. In plain language: it is quite likely that C2 and C4 form a monophyletic clade and I would not be surprised at all if C1 and C3 do the same. But then it is also possible that C5 and the Indian C* and/or the European C6 also form their own distinct branches. It is even possible that some of these lineages are related across subcontinental regions, as was recently found within MNOPS (aka K(xLT)). So we need first to know how they relate with each other a the top phylogenetic level before we can rush to any conclusion. In any case the discovery of C6 adds some preliminary weight to the hypothesis of C coalescing when still in South Asia. There have been some rush to conclusions on the pigmentation of this and another Western European hunter-gatherer based only on genetics. I think that some of the conclusions are most likely incorrect, at least to some extent, because they are based on a SNP which only weights ~15% on skin coloration. rs1426654, which affects skin pigmentation to some degree (correlated with skin color in Indians, irrelevant among modern Europeans because of fixation, weights only ~15% in Cape Verdeans’ skin coloration). Notice that while you can find online reconstructions that give La Braña 1 a very dark coloration, this is not necessarily the case at all but rather an oversimplistic interpretation based only on one allele, allele that is not just dominant in West Asians and Europeans but also, for example, among Gujaratis, who are quite dark for European standards. It seems correct anyhow that this allele was only brought to Europe with Neolithic farmers (Stuttgart had it) but its alleged effect on pigmentation seems very much exaggerated. Fig. 4 from Beleza 2013 highlights that no single gene is decisive in skin pigmentation. It is probable anyhow that La Braña 1 had black hair. It is much more plausible that he had blue eyes because these are much more directly regulated by simple genetics. Extended Data Figure 5: Pairwise outgroup f3 statistics. a, Sardinian versus Karitiana. b, Sardinian versus Han. c, La Braña 1 versus Mal’ta. d, Sardinian versus Mal’ta. e, La Braña 1 versus Karitiana. The solid line represents y = x. 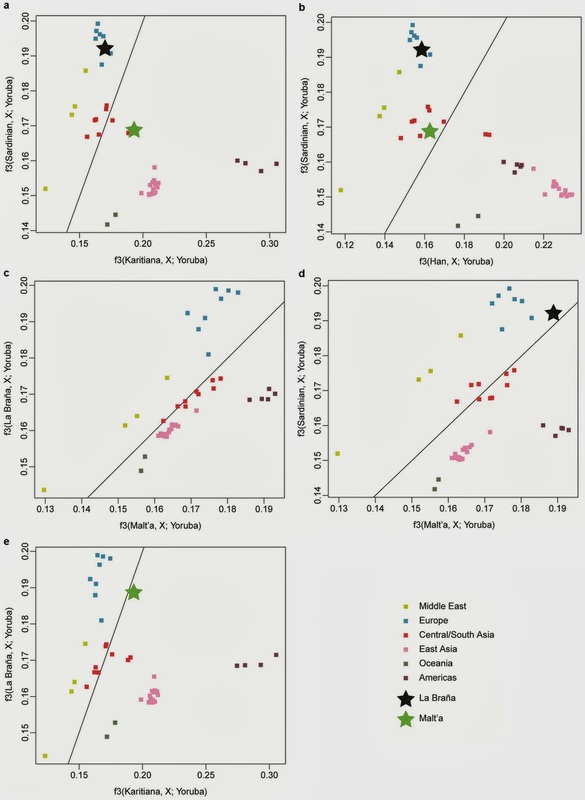 We can see in them that, La Braña 1 clusters well with modern Europeans, while Mal’ta instead strongly tends towards other Asians, often clustering with Pakistanis (“Central/South Asia” metapopulation). Maybe the most interesting graph is c, where we can see how the various populations deviate from the y=x line in the direction of La Braña (Europeans, West Asians) or Mal’ta (Native Americans particularly). Extended Data Figure 4: Allele-sharing analysis. Each panel shows the allele-sharing of a particular Neolithic sample from refs 1 and 3 with La Braña 1 sample. The sample IDs are presented in the upper left of each panel (Ajv52, Ajv70, Ire8, Gok4 and Ötzi). 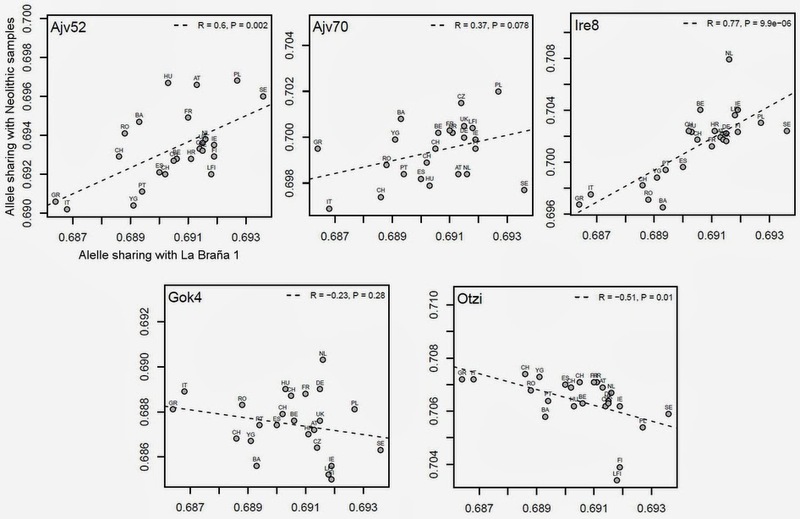 In the upper right of each panel, the Pearson’s correlation coefficient is given with the associated P value. In the vertical scale we can observe how the various populations tend more or less strongly towards various Neolithic samples (again with the same doubts about the significance of the differences). In the first row they are compared with Götland’s Pitted Ware individuals (of plausible Eastern European origins: strong cultural connections with Dniepr-Don Neolithic). Here Central Europeans show the greatest affinity with Ajv52 and Ajv70 (Basques Bulgarians also score high). There are some differences in the case of individual Ire8, whose closest modern relatives seem to be the Dutch. Swedes only score high re. Ajv52 but low to the others, while Finns score neutral-to-low relative to all them. The lower row compares with to mainstream Neolithic samples: Gok4 was a Megalithic farmer from SW Sweden and Ötzi was a Chalcolithic shepherd from Southern Tirol. The Swedish farmer is best approached by the Dutch, followed by various West-Central Europeans, while Basques Bulgarians, Finns and Swedes score low here. In the case of Ötzi nobody scores particularly high (some tendency in Switzerland and nearby areas), while Finns score clearly low. And that’s all I can say without direct access to the study. Enjoy. Update: I already got the paper (thanks again to the donor), I’ll see to update as need be once I have time to read it. Minor urgent edits above in red (and slashed out text). Update (Jan 29): The supplementary data is freely available (LINK) but I could not find it earlier. Almost all the information is in it, including a long list, much longer than mentioned above, of the SNPs found in La Braña 1, compared to various modern population frequencies. I don’t have time right now to dwell on it but I guess from a first read that I will have to amend some comments made on the issue of pigmentation above. Regarding the Y-DNA haplogroup, it is important to notice that its adscription withing haplogroup C seems very clear but its assignation to C6-V20 is more dubious because of the low quality of the genome. Only the V20 marker could be assigned, so the authors themselves are in doubt and wonder if it could alternatively be C* or C5, both with a South Asian affinity. In this sense I think it is worth noticing that the reference Y-DNA site ISOGG has recently revised the phylogeny of macro-haplogroup C and that they have already renamed C6-V20 as C1a2, making it a relative of the minor Japanese lineage earlier known as C1 (now renamed to C1a1), similarly South Asian C5-M356 has been renamed to C1b. 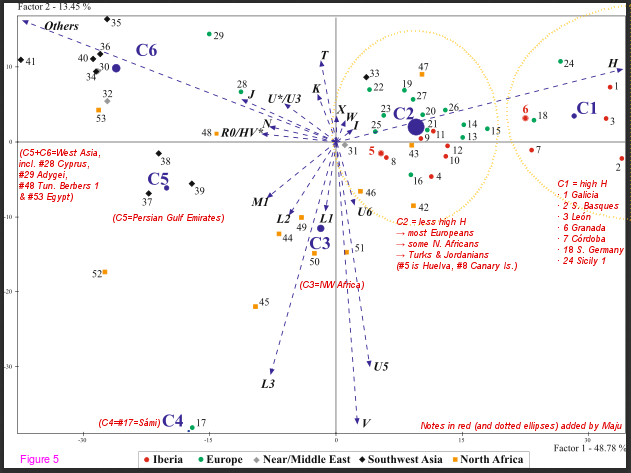 So C1 is now perceived as a lineage that spans all Eurasia with an arguable South Asian centrality. Another (Papuan?) lineage once known as “C6” has long vanished from the phylogeny because of lack of plural samples, I understand. 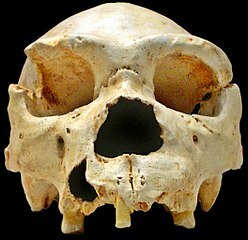 The issue of W-E genetic differences in Iberia has been discussed before in this blog by guest author Argiedude on the grounds of Y-DNA, showing that roughly the Western third of Iberia is distinct from the rest, most notably because of its higher presence of North African lineage E1b-M81. However the differences also appear in the mtDNA, even if they may be a bit more subtle because they cross with a N-S gradient of sorts. A new study focused on the matrilineages of two characteristic Andalusian provinces, Granada in the East and Huelva in the West, underscores that this difference is very real. The archeology and history of the ancient Mediterranean have shown that this sea has been a permeable obstacle to human migration. Multiple cultural exchanges around the Mediterranean have taken place with presumably population admixtures. A gravitational territory of those migrations has been the Iberian Peninsula. Here we present a comprehensive analysis of the maternal gene pool, by means of control region sequencing and PCR-RFLP typing, of autochthonous Andalusians originating from the coastal provinces of Huelva and Granada, located respectively in the west and the east of the region. The mtDNA haplogroup composition of these two southern Spanish populations has revealed a wide spectrum of haplogroups from different geographical origins. The registered frequencies of Eurasian markers, together with the high incidence and diversification of African maternal lineages (15% of the total mitochondrial variability) among Huelva Andalusians when compared to its eastwards relatives of Granada and other Iberian populations, constitute relevant findings unknown up-to-date on the characteristics of mtDNA within Andalusia that testifies a female population substructure. Therefore, Andalusia must not be considered a single, unique population. The maternal legacy among Andalusians reflects distinctive local histories, pointing out the role of the westernmost territory of Peninsular Spain as a noticeable recipient of multiple and diverse human migrations. The obtained results underline the necessity of further research on genetic relationships in both sides of the western Mediterranean, using carefully collected samples from autochthonous individuals. Many studies have focused on recent North African gene flow towards Iberia, yet scientific attention should be now directed to thoroughly study the introduction of European genes in northwest Africa across the sea, in order to determine its magnitude, timescale and methods, and to compare them to those terrestrial movements from eastern Africa and southwestern Asia. Figure 3 – mtDNA haplogroup profiles registered in some populations of the Iberian Peninsula. The two Andalusian subpopulations studied here are marked with a red arrow. Codes are as in Additional file 3. What makes Onubenses (the inhabitants of Huelva, ancient Onuba, West Andalusia) peculiar in relation to their Granadino neighbors is their lower frequency of H (notably H*, H3 and H5), along with their higher frequencies of K1, U3a and several North African related haplogroups (U6, L1b and L2). The peculiarities of Granadinos (notably the high H5 frequency) are not so notable in comparison. Some of these Onubense peculiarities are reproduced in other parts of West Iberia, notably the low frequencies of H (but not at all in the NW corner), the presence of U6 (notably in North Portugal and also, not shown here, among the Maragatos of the León-Galicia border area) and to some extent the elevated frequency of K and some L(xM,N) lineages (varied localized frequencies). Much of this seems best explained by ancient flows from NW Africa (flows which may be Neolithic, Paleolithic or from the Metal Ages but hardly related to Phoenician or Muslim colonization, which had no W-E gradient whatsoever) but I have some qualms about the quick identification by the authors of the origins of Onubense high K1 in that area. At the very least it must be noticed that, unlike the other African markers, K1 is much more common towards the Eastern parts of NW Africa and is also found at similarly high frequencies in many parts of Europe, such as France and Central Europe. K1 was first spotted in Iberian ancient DNA in the early Neolithic (Los Cascajos, Navarre), and was an important Neolithic lineage through Europe. While I can’t discard the North African suggested origin, I think that other possibilities are at least as likely. On U6, the presence of the very rare U6c, one of two basal lineages of U6, only found previously in 5 Moroccans, 10 Canarians and in one Italian, reinforces the idea of U6 expanding from West to East (against what most conclusions suggest on the most unclear grounds) with a most likely Moroccan origin. In turn this raises the question on how pre-U6 arrived to Morocco, especially as the Aurignacoid Dabban industries now seem to never have gone further West than Cyrenaica, opening the possibility of this lineage having arrived to NW Africa via Europe, where we know that U in general was common in the Upper Paleolithic, and which clearly influenced North Africa at the Oranian (aka Iberomaurusian) cultural genesis (LGM) via Morocco (Taforalt and other sites). On the L(xM,N) lineages, it is worth mentioning that Cerezo 2012 claimed that some of them may be pre-Neolithic in Europe, especially L1b1a variants, which are widespread at low frequencies through Europe with an Iberian centrality. Figure 5 – Hierarchical Cluster Analysis (HCA) of 53 populations based on their mtDNAdiversity. The haplogroups used here are marked with arrows (vectors). Populations are indicated with numbers as in Additional file 3. Cluster 1 is particularly noticeable for its high frequency of mtDNA H, being composed by mostly Iberian samples (along with South Germans and some Sicilians). Granada, as well as nearby Córdoba, sit here (even if with a tendency towards the more mainstream European Cluster 2). Huelva is not too remarkable when compared with other European samples in the mtDNA HCA, although it does show some deviation towards NW Africa, clustering closest to Canarians. In spite of the good frequency of North African samples, it must be noted that the horizontal axis, in essence contrasting Europe vs. West Asia, has a weight of almost 50%, while the vertical axis, contrasting these two vs. North Africans (and the Sámi) only weights 13% (axis are almost never of the same relevance in PCA-like graphs, even if they are presented as such). 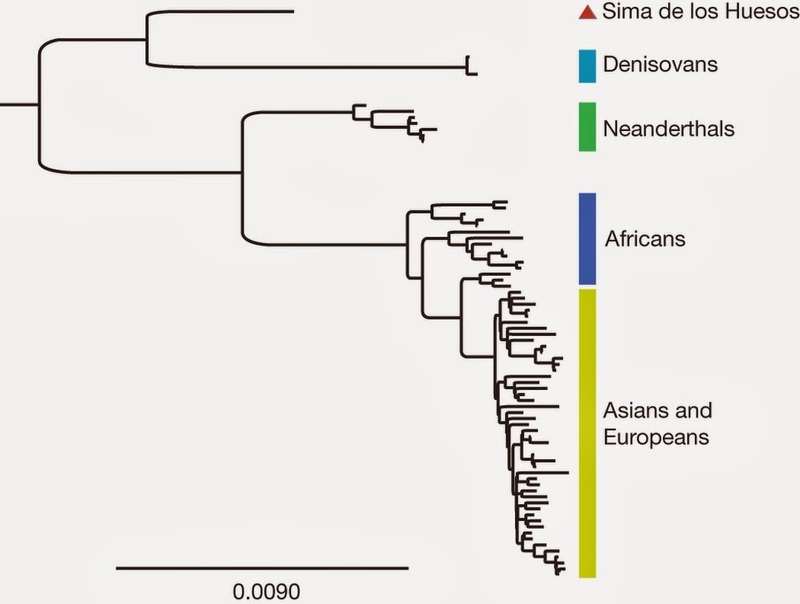 In synthesis: NW Africa had some minor but significant genetic influence in the West Iberian third, long before the Muslim period, and this mtDNA study ratifies these distinctions in the particular case of Andalusia, adding some rich detail of data. Also, as the authors underline in their discussion, the issue of European genetic influence in North Africa still requires some serious investigation. Was the grove snail Epipaleolithic livestock in Western Europe? The problem of disjunct distribution of Western European species or, in this case, subclades of a single species is nothing new and has been startling biologists for almost two centuries already, with particular interest of Irish-Iberian, Breton-Iberian or just general Irish-continental disjunct relationships of various species (the so called Lusitanian distribution). Among them is the iconic strawberry tree (madroño in Spanish, found in Ireland but not Great Britain) but also a number of small land animals: the Kerry slug (found in NW Iberia and SW Ireland only), the Quimper snail (found in NW Iberia and Western Brittany) or the Pyrenean glass snail (found in the Pyrenees and Ireland). There are also cases of subclades within an otherwise widespread species which show a similar pattern. In 2003, Masheretti et al. demonstrated that the Irish variant of the pygmy shrew had its greatest affinity with populations of Andorra, in the Eastern Pyrenees, from which they are descended. This study illustrates a similar case but affecting the snail species Cepaea nemoralis (grove snail or brown lipped snail), whose Irish lineages are mostly derived from Iberian ones and in most cases from the Eastern Pyrenean haplogroup C.
The origins of flora and fauna that are only found in Ireland and Iberia, but which are absent from intervening countries, is one of the enduring questions of biogeography. As Southern French, Iberian and Irish populations of the land snail Cepaea nemoralis sometimes have a similar shell character, we used mitochondrial phylogenies to begin to understand if there is a shared “Lusitanian” history. 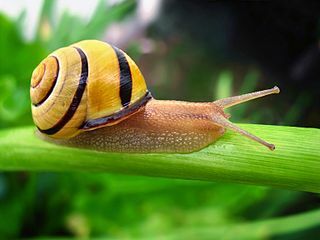 Although much of Europe contains snails with A and D lineages, by far the majority of Irish individuals have a lineage, C, that in mainland Europe was only found in a restricted region of the Eastern Pyrenees. A past extinction of lineage C in the rest of Europe cannot be ruled out, but as there is a more than 8000 year continuous record of Cepaea fossils in Ireland, the species has long been a food source in the Pyrenees, and the Garonne river that flanks the Pyrenees is an ancient human route to the Atlantic, then we suggest that the unusual distribution of the C lineage is most easily explained by the movements of Mesolithic humans. If other Irish species have a similarly cryptic Lusitanian element, then this raises the possibility of a more widespread and significant pattern. Hg D is found in Iberia, Ireland, small pockets in Britain and SW France but also in North and Central Europe. Hg F shows also disjunct presence in Cornwall, far away from the main cluster around the Bay of Biscay. Fossil material indicates that this species has been continuously present in Ireland for at least 8000 years (Newlands Cross, Co. Dublin: 7600+/−500 BP Cartronmacmanus, Co. Mayo: 8207+/−165) , . In other cases, such as the inedible Kerry slug, we may suspect unintentional transport and therefore we would be justified to imagine a later time frame for their arrival to Ireland, possibly in the Chalcolithic-Megalithic period, but the evidence for C. nemoralis is highly suggestive of intentional transport in the Epipaleolithic. We can therefore say that the humble grove snail was one of the first domestic animals of Europe, possibly second after the dog.